The FarmHouse portable greenhouse kit has 2 screened doors and 12 screened vent openings which allow for optimum air circulation. With the vents open, outside air circulates throughout the greenhouse to prepare plants for planting in outdoor conditions. With the vents closed, the 100% waterproof Gro-Tec™ material will promote and maintain high humidity levels desirable for a superior growing environment. 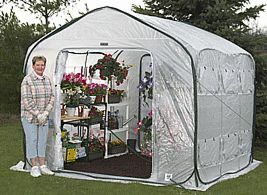 The Gro-Tec™ material is UV resistant with rip stop protection for longer life of your greenhouse. The FarmHouse design provides a convenient and effective way to protect your tender shrubs and perennials against damaging winter environments. Set up easily on soil or hard surface. The large zippered door allows for easy access. The 12 screened vents allow for optimum ventilation and pest protection. It is also a great pond cover for water plants and is perfect for starting plants. 12 zippered windows with screens 13" x 29"